KINDIE LAND: Rockin' kids indie releases, ticket giveaways, video interviews, reviews and tour news via ChiIL Mama. ChiIL Mama's ChiIL Picks List for Family Friendly Fun. This show is a must see! Disclosure: Thanks to Gustafer Yellowgold and Schubas for providing us with a review copy of the new CD. As always, all opinions are our own. Here at ChiIL Mama we've long been fans of this charming yellow alien and his quirky, cool take on our home planet. Gustafer Yellowgold's LIVE shows are out of this world! They're a creative, multimedia extravaganza of animated screen shots and LIVE music by the multi faceted illustrator/songwriter/performer Morgan Taylor! Parents and little folk alike will be captivated and entranced by Taylor's magical melding of music and art. Celebrating the release of Gustafer Yellowgold's Wisdom Tooth of Wisdom, the newest installment in the award-winning series of Gustafer Yellowgold "Musical Moving Book" DVD/CD sets, Gustafer Yellowgold's "The Tooth Will Set You Free" Tour comes to Chicago for an out-of-this world, multimedia family show with full band at 3:00 p.m. on Sunday, October 19 at Schubas, 3159 N. Southport, Chicago. Groovy Gustafer Yellowgold is a friendly fellow who came from the Sun and landed in the Minnesota woods. 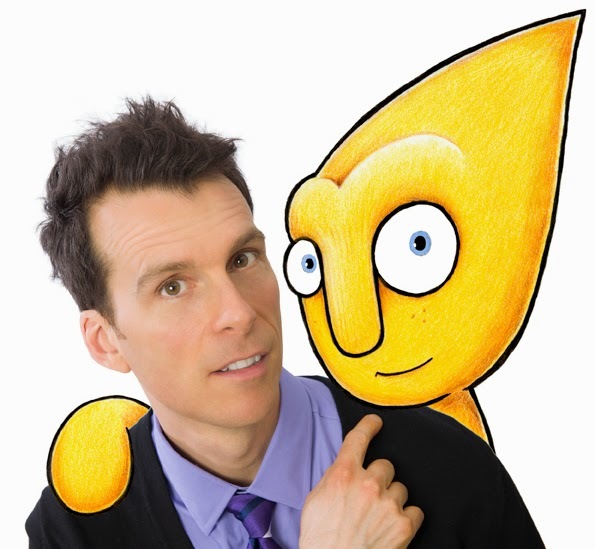 Illustrator/songwriter/performer Morgan Taylor developed the Gustafer Yellowgold experience as equal parts pop rock concert and animated picture book. This live performance will feature new songs and videos from Gustafer Yellowgold's Wisdom Tooth of Wisdom, along with plenty of fan favorites from the five previous Gustafer Yellowgold releases, as well as this year's hit single, "Cakenstein." All are filled with the one-of-a-kind Gustafer Yellowgold blend of blissful pop music, lyrical poignancy, and cartoon absurdity. The songs, by themselves, are loved by people of all ages whose taste runs to alternative pop/rock, while the video elements unfold in graphic novel fashion, revealing an ink and colored pencil fantasy world that's especially appealing to children. Watch Gustafer Yellowgold in action on his Youtube channel HERE. Since his creation in 2005, Gustafer Yellowgold has become an international phenomenon, headlining family family friendly venues all across the U.S., in London, and even in Seoul, Korea. Yet Gustafer is not just for kids! Gustafer Yellowgold's Show has performed as the support act for Wilco and The Polyphonic Spree, and Gustafer has been seen off-Broadway in his own productions of Gustafer Yellowgold's Mellow Sensation and Gustafer Yellowgold's Infinity Sock. The New York Times called Gustafer Yellowgold "a cross between Yellow Submarine and Dr. Seuss." Entertainment Weekly praised, "The most infectious original songs. It's like tapping into some pleasure center in the brain, both adult and kid ... absurdly appealing." The Washington Post declared, "He's a star on stage and screen! ... The mix of catchy tunes and offbeat stories has endeared Taylor, and Gustafer, to teenagers as well." The Chicago Tribune wrote, "Gustafer Yellowgold has made kids' music so cool that teenagers and ultra-hip bands such as Wilco want to get in on the act ... a shiny blend of pop art and pop tunes." 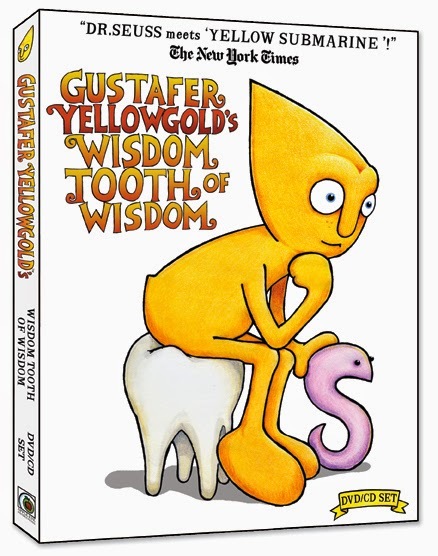 Gustafer Yellowgold's Wisdom Tooth of Wisdom will be available online atwww.gustafer-store.net and amazon.com. An audio-only version will be available from iTunes. Pre-orders may be placed on amazon, iTunes and atwww.gustafer-store.net. WHAT: Gustafer Yellowgold's "The Tooth Will Set You Free" Tour Comes to Chicago! First to comment! Hope to win tix? Sorry. We cross posted on FB & Twitter so the ticket giveaway is a done deal as of Friday. Hope you do still check out the show. It's going to be amazing! Check back with ChiIL Mama like we vote in Chi, IL... early and often. It's rewarding. We have lots more ticket flash giveaways (super easy) and longer running traditional giveaways for games, toys, books, DVDs/CDs, and more open nationwide. Good luck!